MY ? IVE GOT A POODLE SHE CHEWES ON HER BODY TILL IT BLEEDS I GOT FRONT LINE SHE STILL ACTS LIKE FLEES ARE EATING HER UP I PUT BOTH PKS ON HER I ALSO GOT A COUPLE OF FLEE COLLARS. WOULD IT BE OKAY IF I PUT A FLEE COLLAR ON HER WHEN I GOT IT.THANK YOU VERY MUCH ILL LOOK FORWARD IN HEARING FROM YOU. HAVE A GOOD DAY LET MR HEAR FROM YOU SOON PLEASE. You can keep the flea collar on her while using Frontline. We can also recommend the new more effective product from the same manufacturer called Nexgard for flea and tick prevention. The both product should work safely at this point. Considering he is 9 month old, if there is a potential of gaining weight then large dog version may be better option for you. 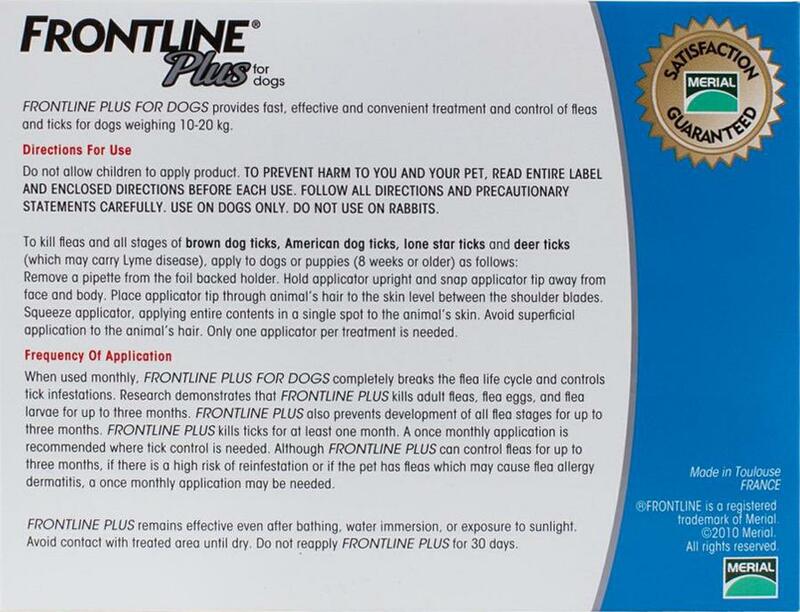 If your dog is 50 pounds you need to give him Frontline Large dogs (44 - 88 lbs) regardless of his age. when using fronline, when is dog able to bathe between applications.